It's finally spring and time to plan your spring/summer garden! Why not add some edible flowers this year? Many Sonoma County gardeners enjoy planting edible flowers, not only because they are a tasty addition to a variety of dishes, but also for their valuable contribution to the health of the garden. Edible flowers attract beneficial insects to pollinate the garden and provide an ecological balance against harmful pests. They also are colorful, fragrant and beautiful to look at! Learn more from Master Gardener Food Gardening Specialists Ellie Samuel and Ellen Scarr. When Can I Plant My Tomatoes? Quick answer: After all danger of frost has passed. Tomatoes are a warm-weather crop. Cool or cold temperatures can cause problems: stunted growth (or worse) and increased likelihood of disease. Tomatoes will do fine in a temperature range of 65 to 90 degrees F with growth slowing below 65 degrees F. The University of California states that 80 to 90 degrees F provides optimum growth, and that 50 to 55 degrees F is the minimum night temperature range for fruit set. UC suggests waiting until May to transplant tomatoes north of Monterey County. Some county gardeners transplant tomatoes after mid-April (with a few pushing that envelope). April weather is a tricky thing in Sonoma County. And, the county has many microcrimates with which to contend. While the past isn't a perfect predictor of the future (especially with the wacky weather recently), we can consider NOAA's climate data for the average last frost date in our area, in addition to our own observations, when making planting decisions. If you're not sure what that date is, see our document, First and Last Frost Dates. The date varies greatly because of the previously mentioned microclimates. Even your own yard has microclimates--you probably have observed cold downhill drafts or depressions in which cold hovers. Some gardeners will create walls of sun-warmed water using milk jugs or plastic tunnels, or take other protective measures in order to transplant tomatoes as early as possible. But, know that if exposed to too cold of temperature, even if the tomato survives, growth can be stunted and production can be affected for the duration of the growing season. Low temperatures can be responsible for blossom drop, fruit deformation such as catfacing and disease. A good strategy for the risk adverse is to transplant when day temperatures are at least 75 degrees, but be prepared to protect plants if night temperatures are predicted below 60 degrees. Our newest additions to the food gardening articles on the website include "Focus on Spring Vegetables" and "Focus on Fall Vegetables." Each is a a two-page guide that includes an example of a planted 4 x 8-foot raised bed on one page. 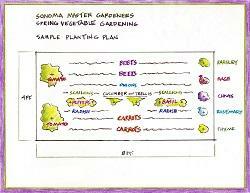 The second page outlines planting, care and harvest information (as appropriate) for the veggies in the sample beds along with recommended varieties for Sonoma County. 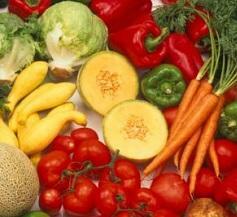 "Focus on Spring Vegetables" includes making room for warm weather veggies. So, be sure to wait until the threat of frost has passed before planting heat-loving crops such as tomatoes and cucumbers. "Focus on Fall Vegetables" includes hardy veggies that can overwinter in a typical Sonoma County winter, providing you an extended harvest. Reference "Year-Round Food Gardening in Sonoma County" to learn which vegetables are cool-weather, hardy and warm-weather. Whether you are a new or experienced food gardener, there will be something of interest for you at the FREE spring food gardening workshop offered by the Master Gardener Food Gardening Specialists. No pre-registration is required. 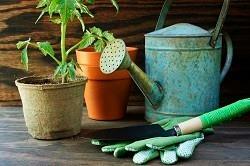 Some of the instruction happens in the garden—bring your sun hat, garden gloves and water. We hope to see you there! May 11, 10:30 am - 12:30 pm: Spring and Summer Food Gardening. The Food Gardening Specialists are continuing the Year-Round Food Gardening Series in the Windsor Community Garden. It's time to transition from the fall/winter food garden. Topics will include selecting the right tomato plant; integrated pest management (managing weeds and attracting beneficials); and growing your culinary herb garden. Bring your hat, sunscreen, water bottle and questions. The garden is on the northwest side of the Windsor Town Green, at Windsor Road and Joe Rodota Way, just off the Windsor Civic Center Parking Lot. In addition to spring/summer and fall/winter food gardening workshops, you will find a plethora of food gardening guidance on the website from the basic A to Z "Growing Vegetables" publication and the when-to-plant "Year-Round Food Gardening in Sonoma County" publication to how to set up a food bed irrigation system and calculate just how much water your food garden needs—and MUCH more. There is an extensive library of vegetable, fruit and herb articles for crops that thrive in Sonoma County. For a full listing, see "Food Gardening Articles" and the Food Gardening section of "MG Publications." Also, like and follow us on Facebook where you will find two weekly food gardening features. On Wednesdays, Master Gardener Food Gardening Specialist Penny Fink shares her experience growing vegetables and fruit on a hillside in Occidental. You will relate to and be energized by "Penny's Farm" and her seasonal activities, challenges and advice. "Sundays with Sue" is all about edible landscaping (with a few chicken stories and floral/greenery arrangements thrown in for good measure). You will be charmed and inspired by Master Gardener Food Gardening Specialist Sue Lovelace's posts. Food Garden Specialists (FGS) are volunteers in the UC Master Gardener Program of Sonoma County. They have a passion for and extra training in sustainable food gardening. In addition to offering food gardening workshops, they provide free advice and consultation services to community gardens throughout Sonoma County. Read more. 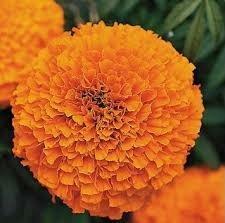 For what to grow this month, click here. COMPOST! MULCH! WEED! These actions will help you keep moisture in the soil during our hot dry season. Lightly incorporate 2-4 inches of compost in your soil to retain moisture, improve soil health and to see higher yields with the same amount of water. Or, you can simply add a 2” layer of compost on top of the soil. Let irrigation and the macroorganisms move the nutrients into the soil. Add 3-4” of mulch (straw, decaying leaves, grass clippings, etc.) to retain water, cool soil and suppress weeds that compete with desirable plants for water. Or, simply add more compost. Leave a gap around the collar/stem of plants to avoid rot. Strawberries and blueberries prefer acidic mulch such as pine needles; straw is also good. Coffee grounds also work well on blueberry beds. If you want to add 2 inches of compost in an 8 x 4-foot raised bed, you will need 0.20 cu yd of compost. If you want to add 4 inches of mulch to the top of this bed, order 0.40 cu yd of mulch. Rely on compost as your slow-release fertilizer. Caution: If you add too much compost or additional high nitrogen fertilizer, you may see a green flush of growth that will require extra water and will attract more insects. Start irrigation when there is insufficient moisture in the soil. However wet the winter, Sonoma County has water availability issues, so, always plan to conserve water. Check the soil daily. Dig to the active root zone level or use a probe to check soil moisture. Watch plants for signs of stress (wilt, dull leaf color). When the weather is hot, a good strategy is to divide the plants’ weekly water needs into single daily applications so that there is even soil moisture. If you can only water very other day, then double the daily amount. Currently, April 15 is the average last frost date in the county. This is just an average in a county with many microclimates. Low spots in Sonoma County can have a frost risk into May, but for many of us April is when we start planting our summer veggies. Watch weather predictions and protect any warm weather crops set out before the end of the month. See the list of plants that can be planted safely in April. When buying transplants, look for uncrowded sturdy seedlings. Stay away from thick peat pots that don’t decompose well in Sonoma County’s hot, dry summer. Also, look for crops and varieties that are “drought-tolerant” or “drought-resistant.” Don’t be tempted by large flowering plants in small pots—they will be root bound and will have depleted the soil nutrients. Check out our “Drought Resistant Crops and Varieties” guide. One place to buy good starts is at the Harvest for the Hungry tomato/veggie plant sale, on Saturday April 27th, 9am – 2pm. Build or purchase trellises for spring/summer crops that may require support or that you wish to grow vertically. Peas, beans, cucumbers and tomatoes are easy to grow on a trellis or in an upright cage. Install the trellis before planting. Potato towers also save space and provide a long harvest if you layer late-, mid- and early-season varieties in the tower. Continue to thin/harvest any root and salad crops for proper spacing. During the spring bloom period, fertilize citrus. For mature trees use 3 lbs of urea or 20-30 lbs of animal manure (reduce for smaller trees), splitting the application into three: April, June and August. Citrus is a heavy water user. Consider waiting until fall before buying and planting new trees. If you haven’t already done so paint, or re-paint, the trunks of your deciduous fruit tress to protect from sunburn. Note that the half-and-half mixture of white latex paint and water we usually recommend in not organic—there are organic tree-trunk protection products available on-line but they do cost more. Codling moth can be a significant problem for apple and pear trees. If you had “wormy” fruit last year, spray summer oil weekly during the egg-laying period, which is anytime moths are flying. An option for backyard orchards is hand thinning to remove all infested fruit during each generation (before “worms” leave fruit) and removal of dropped fruit. Most grape varieties are susceptible to powdery mildew. Once it appears, it is too late to treat. Powdery mildew is controlled during the growing season by spraying with water-soluble sulfur. Begin applying treatments when all buds have pushed. Thereafter, repeat at ten-day intervals in the spring if disease pressure is high. As spring planting begins in earnest, select disease-resistant crop varieties (especially important in a small garden where crop rotation is difficult). The abbreviations on the tag are important (e.g., “VFN” means that a plant is resistant to Verticillium wilt, Fusarium wilt and Nematodes). If earwigs are gnawing on your plants, trap them with rolled newspaper, bamboo tubes or short pieces of hose. Place these traps on the soil near plants just before dark, and shake accumulated earwigs out into a pail of soapy water in the morning. Click here for ongoing monthly tasks.